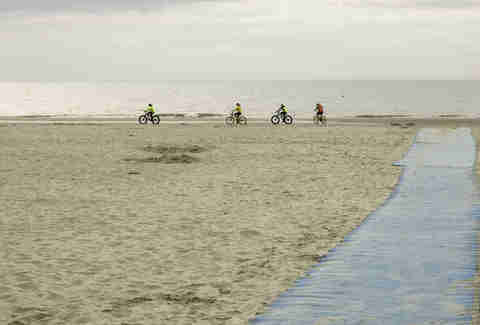 Most beach vacationers in South Carolina opt for the putt-putt and pancake houses of Myrtle Beach or the golf-and-family-bike-rides feel of Hilton Head. 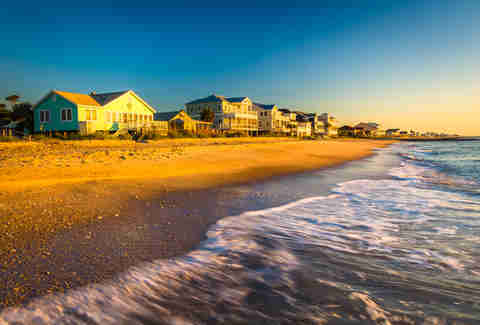 In between the state’s two main beach draws, though, SC’s 200-mile coast becomes broken by river inlets, salt marshes, and the shallow waters of the vast Cape Romain -- and scattered along this coastline are tiny barrier islands with sandy shores, each sporting their own cultural and natural attractions. In other words, no matter what kind of vibe you're after, there's a stretch of beach perfect for you. From shag dancing, to rich fisheries, to hanging ten on a wave, South Carolina’s beaches shape and embody the state’s culture. Traveling north to south, here are the top eight road-accessible beaches worth exploring. 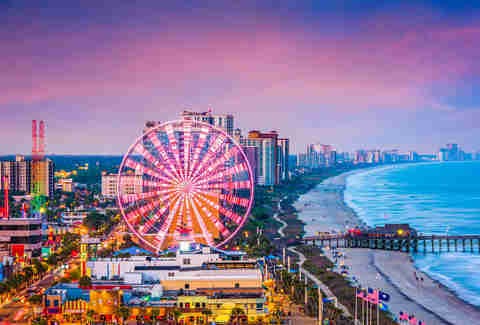 These days, the city of North Myrtle Beach sprawls almost to the North Carolina border, but its historic downtown and adjacent beach remain intact and as endearing as ever. Shag dancing and beach music (think: “Under the Boardwalk”) still thrive here, and strolling Main Street on a Saturday night is like stepping half a century back in time. Inside Fat Harold’s Beach Club, the dance floor is an all-ages sea of spinning partners and fancy footwork. The beach itself is popular with families and lined with resorts offering chair and umbrella rentals -- but if you don’t need those services, walk a few hundred yards north to escape the crowds. 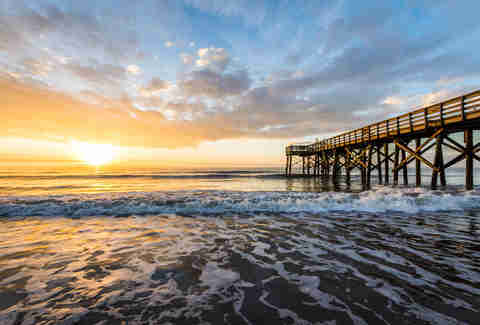 It’s a 15-minute stroll to neighboring Cherry Grove Beach, which has an idyllic oceanfront park, and the iconic Cherry Grove Pier, where you can cast for tarpon and sharks and take in the view up and down the coast. Where to eat/drink: The beach itself doesn’t have much in the way of notable food, but a daiquiri and a burger at Coconuts Tiki Bar & Grill (at the Maritime Beach Club) can hit the spot midway through a hot afternoon. A five-minute drive inland, SeaBlue sources local fish and sports a solid wine selection; blue mood lighting and an aquarium make up for the strip-mall locale. Rockefeller’s Raw Bar is a more authentic-feeling seafood joint, with inviting captain’s chair bar stools for slurping raw bivalves. Pro tip: you'll want to arrive early during summer, when lines back up out the door. 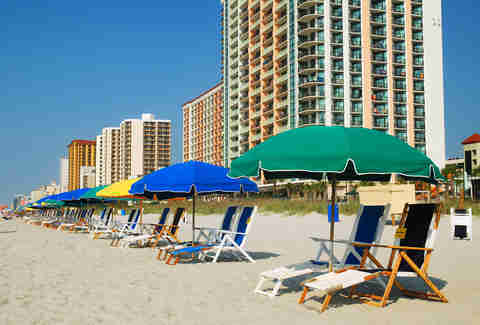 Collectively known as the Grand Strand, Myrtle Beach’s 60 miles of sand and condos quickly begin to all look the same, but the stretch from 1st Avenue North to 14th Avenue North stands apart for its boardwalk and promenade, which extend along nearly a mile of oceanfront. This is a lively, jam-packed section of sand you can walk back and forth and people watch all day. On hot summer nights, attractions like the SkyWheel and Adventure Matrix Aerial Park at Zipline Adventures are teeming with eager families and packs of teens, and it’s an experience just to walk the strip -- although you won't want to bypass the stalwart Gay Dolphin gift shop, open since 1946. If you somehow tire of the beach, don't worry: There's still a ton of fun, non-touristy things to do in Myrtle Beach. Where to eat/drink: The boardwalk is bookended by two acceptable seafood restaurants with views across the ocean. On the north end, you'll want to order a beer and a platter of fried oysters at Pier 14; at 2nd Avenue N, the Pier House is slightly more ambitious with its seafood offerings, but the main attraction is the beachfront open-air deck. For the best seafood in town, continue your walk another mile and a half past the boardwalk to Sea Captain’s House, a 1930s beach cottage that’s survived the condo creep that surrounds it by appeasing the circling developers -- and hordes of visitors -- with its toothsome crab cakes. Famous for its rope hammocks, Pawley’s Island directs most of its visitors to the Hammock Shops Village that fronts Highway 17 -- but those who venture off-highway to the island itself are rewarded with sweeping marsh views, an uncrowded beach, and a slower pace of life. This is the northern end of what’s considered “low country,” and the culture shift is evident at spots like the Sea View Inn, a pre-Airbnb throwback with communal meals for guests and a welcoming lack of TVs and electronics. This is a self-service, relaxed beach, meaning you'll need to bring your own chairs, umbrellas, and snacks. About 20 minutes north on Highway 17, the sprawling Brookgreen Gardens sculpture garden and zoo is definitely worthy of an afternoon visit. Where to eat/drink: Meals on the island are pretty much down to whatever you bring with you, but there are plenty of options a mile away on the mainland. Frank’s is the fine dining mainstay -- reserve a table on the terrace and order the local grouper -- but for casual eats, Habaneros has tasty fish tacos, and Hog Heaven BBQ is a country-cooking institution where no one leaves hungry. Pawleys Island Tavern (or the PIT, colloquially) serves up great pizza on a shady patio with live blues bands playing on the reg. Known locally as IOP, this 6.5-mile-long island has a lively commercial hub that boasts a legendary oceanfront concert venue, The Windjammer. Its heyday was Hootie’s early-‘90s glory years, but it’s still a sought-after stage for local bands and comes alive during their bikini contests and beach volleyball events. Here in the center of the island, the beach draws an all-ages crowd on weekends, with the party congregated around the Jammer. The island is also home to Wild Dunes Resort, a gated family paradise with bike trails, pools, golf, and a couple miles of sparsely used beach, which is open to the public if you hoof it north from the last public access off Palm Boulevard at 56th Avenue (it’s an excellent running route for beach joggers). 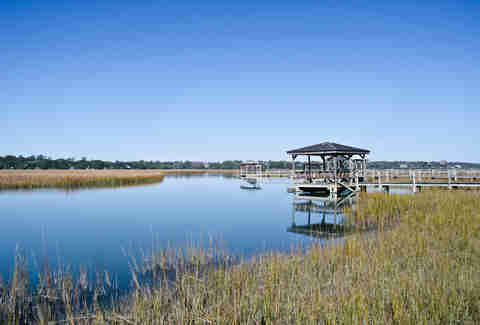 On the north end is Isle of Palms Marina, where Tidal Wave Water Sports departs for parasailing trips and rents boats and Jet Skis for exploring the Cape Romain National Wildlife Refuge. 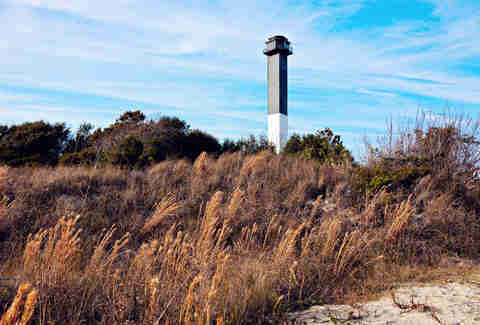 Ride out to Capers Island to see a boneyard beach, where the ocean is gradually eroding away at the forest. Where to eat/drink: IOP’s strip sports oceanfront tourist joints like the cheesy but charming Coconut Joe’s (come for live reggae on Sunday afternoons) and inspired fine dining at Italian/seafood trattoria, Coda del Pesce. The marina restaurant, Morgan Creek Grill, is a local hotspot on weekends, when it fills up with boaters docking up for a cold one and a game of bean bag toss on the lawn. Sullivan’s property values are the highest in the state, thanks to its proximity to Charleston, large lots, and genteel atmosphere (although neighbors like actor Bill Murray keep the mood light). Edgar Allen Poe was stationed here with the U.S. Army in the 1820s, and his legacy remains at the town library and a burger joint named in his honor, as well as at Fort Moultrie, a national monument operated by the U.S. National Park Service. South Carolina’s archetypal state flag has its roots here -- the original fort withstood British cannonballs thanks to the shock-absorbing attribute of palmetto tree logs. From the fort, take in the views of Charleston Harbor and then head to the beach at Station 28.5 (on Sullivan’s, beach blocks are called “stations”) to watch kite-surfers shred in a unique, natural lagoon formed by an offshore sandbar. Sealand Adventure Sports offers lessons if you’re ready to join the wind riders. Station 16 is the starting point for a nature trail that winds through a 200-acre forest before emerging through the dunes onto a peaceful, low-traffic beach. Where to eat/drink: A visit to Poe’s is a must for anyone on Sullivan's -- order the Tell-Tale Heart or the Gold Bug burger -- while across the street, Home Team BBQ is known for its pulled pork, hearty sides, and frozen painkillers. On an island with several excellent food options, though, the star is a few blocks beyond the main drag; The Obstinate Daughter is a destination unto itself, where you'll indulge in ricotta gnocchi and the Duck Amuck pizza, topped with gorgonzola, roasted grapes, and duck confit. Downstairs, Beardcat’s offers excellent coffee and gelato. There’s an end-of-the-road vibe at Folly Beach, where a long-standing reputation as the working man’s beach is dragging its heels in the face of new million-dollar homes and condos erected along the route to the island. The dudes still abide here, thanks to legendary surf breaks at The Washout (where the island narrows to a couple hundred feet and washes over during hurricanes) and at the Folly Beach Fishing Pier, where the less wave-inclined can sip a cold beer and cast a line into the ocean. 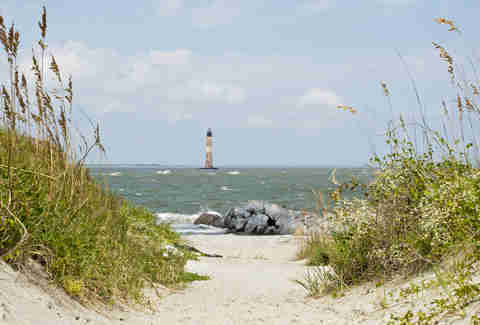 The park at Folly’s north end is the primary viewing point for the ghostly beautiful Morris Island Lighthouse, although you shouldn’t swim here, as tides whip through the inlet and the beach drops off steeply (the rest of Folly Beach that faces the ocean is ideal for swimming). To get even closer to the lighthouse -- or to spend the day with a remote beach all to yourself, searching for shark teeth -- catch a ride over to Morris Island with Captain Dickey of Flipper Finders Boat & Sea Kayak Tour Co.
Where to eat/drink: Massive flavors emerge from the minuscule kitchen at Jack of Cups Saloon, a destination for curries, pastas, and shareable dipping bowls. Next door, the Drop In Deli is a go-to for sandwiches, and the pop-up Sushi by Lisa bar is open every Tuesday-Friday night. If you can’t get a table at Lost Dog Café during the Sunday afternoon rush, the unassuming ‘Wich Doctor sandwich and pizza joint cooks a Vietnamese brunch that’s as memorable as any Benedict or omelet available in downtown Charleston. For seafood straight from the source, rustic Bowens Island is a low-country legend. For even more dining options here, you'll wanna check out our comprehensive Folly Beach restaurant guide. It’s worth visiting Edisto just for the drive down Highway 174, a National Scenic Byway that’s lorded over by live oak trees draped in Spanish moss. Once on the beach, the geographical isolation maintains a lost-in-time community feel, where attractions like The Serpentarium (a family-run museum of live snakes) still thrive. There’s an intriguing mix of family vacationers and salty-dog locals here, but hurricanes have taken their toll on Edisto Beach, and erosion has left only a small strip of beachfront at high tide -- the positive side of which is the boneyard beach left behind at Botany Bay Plantation, where trees emerge from the surf as the ocean overtakes the maritime forest. Where to eat/drink: Edisto’s dining scene is mostly fried-seafood-and-beer joints like the timeless Whaley’s, where you’ll find a rollicking local crowd every weekend. Just off the beach, the refined Southern fare at The Old Post Office has long given Charlestonians an excuse to take the scenic drive out to Edisto. Inside Edisto’s golf course community, Ella & Ollie’s is the island’s most upscale bistro, but it’s still casual enough for after-beach shorts and flip-flops, and suitable for families. A premier vacation destination for decades, Hilton Head has a dozen miles of beaches, two dozen golf courses, and hundreds of ways to while away a week of family downtime. The road onto the island dead-ends into Coligny Beach, making it the island’s activity center. The beach itself has lifeguards on duty and chairs for rent, plus parking, bathrooms, and a big play fountain for little kids not yet ready to swim in the ocean. It’s also home to the Coligny Theatre, perfect for cooling off with an afternoon matinee. Where to eat/drink: Coligny’s sunset scene is centered around the Tiki Hut, a beachfront bar where live bands play to an audience dancing in the sand. If you need a satisfying meal but don’t want to leave the beach, The Porch (inside the Beach House Resort) offers a tasteful menu of gussied-up Southern fare, priced for the location. You’ll need to shower the sand off and put on slacks, but nearby Michael Anthony’s is an island staple highly regarded by locals for its homemade pasta and Italian fare. Stratton Lawrence is a writer and editor based in Folly Beach, South Carolina, where he catches waves just outside his front door. It took some convincing to move his wife, a lifelong Isle of Palms native, over to the Edge of America. When his family escapes for the weekend, they’re most likely found kicking back on Edisto Beach. Find Stratton on Instagram and at his website.